First of all, regardless of the name, this Council Tool ApocalAxe has uses well before the apocalypse arrives. And while it would certainly make a formidable and handy zombie stopping weapon (seems killing a zombie is redundant), the ApocalAxe will work fine on those that haven’t had the privilege of dying the first time. Made of hammer-forged steel, the ApocalAxe is far stronger than stamped steel that would save costs and simplify manufacturing. The ApocalAxe on the other hand has its iron grain aligned through being smashed with 20 tons of force while glowing red hot. Although the forging process might produce superior strength, it is a little rough around the edges from a finishing standpoint. 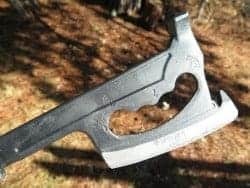 But as a fan of hand-forged Swedish axes, the spit and polish of modern high speed manufacturing is easily overshadowed by performance and durability. Council Tool has been forging American-made cutting, digging and striking tools since 1886 when John Pickett Council founded the company. Based in Lake Waccamaw, North Carolina, Council Tool has been instrumental in not only forging some of the best US-made traditional tools, but also in the design of new lines of tools for specific purposes. For instance, when the US Forest Service approached Council Tool in the 1930s to create forest fire fighting implements, one outcome was the Fire Rake, or catalog number LW-12 in case you want to order one. The ApocalAxe contains a set of essential tools and grip choices, and one not-so essential bottle opener. However, the near-six-inch cutting blade, the hammer head, gut hook, and the pry bar end are truly go-to essentials of any large survival multi-tool. The domestic chores the ApocalAxe can handle need little introduction, but the survival elements of the ApocalAxe cannot be underestimated. On the domestic side, the blade is both a hatchet and a knife. An Ulu knife to be more specific. With a gripping surface above the blade edge, it is a direct and complete transfer of precise force from the hand to the cutting surface. Traditional knives have the blade leveraged from a distance, but the Ulu is more like brass knuckles. As a hatchet, the ApocalAxe behaves itself quite well. The head weight of the ApocalAxe is low compared to axes with edge lengths this side. 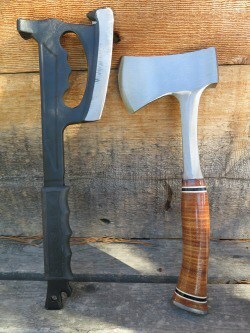 Well, actually, I don’t have a traditional axe let alone hatchet that has an edge anywhere near this size. In fact the only edge close to this is the Timahawk, another tool with tremendous survival leanings. Even my 35” Gransfors Bruks Felling Axe has a blade a full inch shorter than the ApocalAxe. On the far end of the main blade is a smaller blade in the form of a guthook/seatbelt cutter. Due to the placement of the grip handle forged into the main blade area, this gives great purchase and tremendous leverage when using the gut hook. The grip also provides the same advantage but in the opposite direction when applied to the main blade. This is much like the classic Ulu Knife that has provided Eskimos and vintage hunters a fabulous knife design for meat slicing, light chopping, and skinning. A hammerhead is found opposite the main blade. It is smaller than a traditional framing hammer face. In fact, one would have to drop down to something in the 12 ounce claw hammer range before finding a similar hammerhead size. Notably, the head is also quite smooth, and could use some texture if pounding nails is a major use of the ApocalAxe. But for general pounding, breeching, and occasional self defense, the hammer head works quite well as-is. Another feature of the hammerhead is as handguard keeping a secure fist on the forward grip. When using the blade as an Ulu, or yanking on the gut hook, the web of your hand butts up against the neck of the hammerhead. The southern end of the ApocalAxe features a lightly tapered prybar edge, a bottle opener, and a lanyard hole. In between the main edge and the pry bar is a rubberized grip almost five inches long. And hidden under the grip are a series of holes that will make excellent paracord anchor points should the apocalypse outlast the rubber-covered handle. This would be a good time to address the overbuilt and uber functional sheath. Similar to many full-cover axe sheaths, the ApocalAxe cover is a full leather, fully stitched complete cover with no less than eight steel rivets. Belt slots outfit the back of the sheath along with a single D-ring to use in a dangling configuration. But the real advantage is that with the blade cover on, full access to the hammer head and pry bar features are accessible and encouraged. A fold-over flap with a single snap secures the cover. In the field, the ApocalAxe chops very well. Not quite a dedicated axe, but plenty good enough. In fact, for general chopping chores, the ApocalAxe could easily be a go-to hatchet, no questions asked. Even though the blade is on the larger side, it chops like a smaller edge in average sized workpieces. If you put the entire blade to work such as on a larger diameter branch or trunk, you would quickly hit the end of the leverage of this tool. But again, these are not intended functions of the ApocalAxe. When choking up on the blade using the Ulu-like handle, the axe behaves better when punched or swiped. Pounding straight down into wood does little since the small amount of force is distributed over too large an area. As a hammer, the ApocalAxe pounds with more force than you usually need with a head this size. Common outdoor hammer uses are nails and tent stakes, but as a weapon, this is pretty good choice. 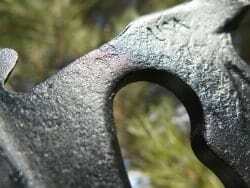 It is also the ApocalAxe surface of choice for breaking glass, windshields, and lightweight breeching. The axe blade is for chopping. The hammer is for pounding and breaking. As mentioned, the gut hook does an admirable job especially after a touch up with file and ceramic rod. Council Tool knows that those serious about their edged tools often prefer to do the final detail sharpening. While the blade of the ApocalAxe comes sharp enough to get the adventure going, power users will want to hone the edge to their preference. However the gut hook could use a polish no matter who uses it. 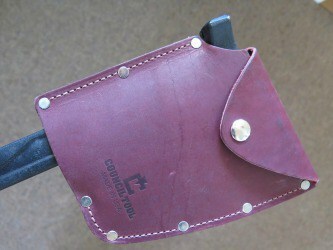 Out of the box, the gut hook had a tough time with elk hide. But a few minutes with a file, stone, and ceramic, the ApocalAxe could be yanked through thick hide and seat belts alike. 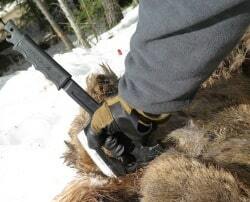 Since hunting season is still a ways off, I went to work on a roadkill to see how the ApocalAxe worked processing game. Well, gamey game, that is. Like the guthook, the main blade would do well for a customized sharpening for specific tasks whether wood or meat. Not that the factory edge wasn’t sharp, but it was not at the level of sharp that I am used to handling. Compared to some of my other stamped steel options, this Council Tool ApocalAxe is vastly stronger, and you can easily feel it when in use. In fact, I would like to reference Snap On again. Tools might look the same, but the forging, heat treating, and especially the very iron from which it was birthed, makes all the difference in the world. And there are plenty of YouTube videos of catastrophic failure to backup my personal experiences. A human under an adrenaline rush due to escape, evasion, defense, or panic can easily deliver enough force to fail a foot-and-a-half pry bar. Heck, even without adrenaline I’ve bent spud bars that are inch-thick circular steel about five feet long. I bent Estwing axes, bent large screwdrivers, bent crowbars, and snapped sockets. I’ve broken pipes with a wrench, crushed oil filters, and snapped off lug nuts. So unless your survival tool has that final 10% stronger everything, you literally won’t know it’s limitation until you actually need it. I mean really need it. Likewise, if your intended needs may include some precision in your prybaring then the somewhat coarse taper on the pry bar tip could use some thinning. Now I am comparing the ApocalAxe to my go-to pry bars made by Snap On. But those are dedicated pry bars and have little use elsewhere. Council Tool thoughtfully ships the ApocalAxe with the option to remove some material if desired which is infinitely easier than to add missing iron. Finally there is the bottle opener. The one on the ApocalAxe is fun to use simply because it has such a brute force lever arm behind it. 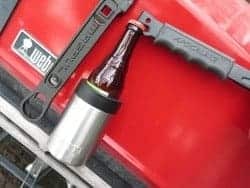 It opens bottles as well as any good bottle opener, and just might displace my favorite opener namely the Magpul Armorer’s Wrench. But opening bottles is not the only use for this tool. The prying feature of a bottle opener can be applied to anything else that needs prying and has a similar lip geometry as a bottlecap. 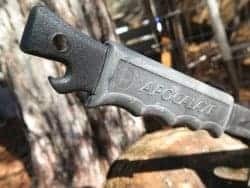 While the ApocalAxe will certainly be an exceptional heavyweight multitool for darker times, the ApocalAxe is also a necessary car, truck, or bug out tool for both escape and rescue. And should the zombies attack, the ApocalAxe will make a fine defensive and evasion tool. But seriously, zombies are little more than a metaphor, and EMPs are (hopefully) a fictional vehicle for prepper fiction. But non-fiction vehicles often need a little assistance when bent or rolled over. Glass needs breaking. And wood needs chopping. So while the ApocalAxe might have some heavy overtones in its name, you don’t need an apocalypse to put this essential tool to work.